16. Is it true that termites can destroy a building whose frame is made by wood? Yes, it is true, unless the building’s frame is made of termite treated wood, or naturally termite resistant wood. 17. Can they eat the heart of a wood beam? All the volume of a beam/balk has cellulose, including the heart; for this reason, the whole balk can be devoured by termites. They begin to eat it from the inside out, leaving a hollow shell in the end. 18. How is a termite colony formed? Usually, a termite colony begins when a royal couple find a favourable place to protect themselves and their nest. After the first step, egg laying begins, proceeded by the hatching of the nymphs. Another way a colony starts is the accidental transport of infected wood that normally, is used for heating and is accumulated above the floor; from this, termites may move to a hole or crack in the floor to form a nest. A part of the colony can be isolated too, so that some of their members can turn into secondary reproductives. 19. There are termites in my house for many years and I do not see big damage. Must I worry? Damages produced by termites are not visible over a short period. Generally, damage is detected when termites have been working for years eating the wooden elements; as explained earlier, they leave the wood surface untouched. For this reason, when termite damage is detected, it is very important to treat them early, to avoid even worse damage later on. 20. How long is the lifespan of a termite colony? For some species, termite colonies can last for an unlimited period of time; since when the royal couple disappears, they can be replaced by other members of the colony. 21. How can know if I have termites in my house? If we pay attention, termite damage can be detected. Many times, we can observe undulations in the surface painting of woodwork, which, if we press with the finger, will cave in. Sometimes we can observe discoloration of the wood surface. Another sign of the presence of termites is the appearance of mud tubes over the walls or hanging from wooden beams. 22. What must I do if there are termites? If you have termites, maybe you are not the only one and your neighbours are affected too. It is important to bring it to the authorities’ attention, since this is a problem which usually affects more than one home. The next step is to find a termite control company, with experience in termite treatment and control. Furthermore, we must make sure that the means used to eliminate the colonies are as safe (environment-wise), as possible. 23. Which elements of a property do they usually attack? In modern housing structure, frames of doors and windows of the first floor are frequently attacked. In older buildings, termites attack the beams in the ceiling and landings too, placed over door thresholds and windows. Boxes on the floor and documents kept in shelves in contact with the walls are attractive to termites, too. 24. Do preventive measures exist to prevent termites from spreading? To avoid termites spreading in an uncontrolled way, you can take a series of measures. One of the most important is to eliminate the sources of moisture that exist in your home. Avoid storing wood in contact with the floor; use some mounting supports of iron, to place under it. Keep cellulose material away from floors and walls, to prevent termites accessing them. 25. What are the mud tubes they make? Termites make mud tubes to protect themselves from the external environment and avoid their desiccation. The tubes they make are composed of soil they collect from the ground and their excrement, which is blended with their saliva, to obtain a mixture. 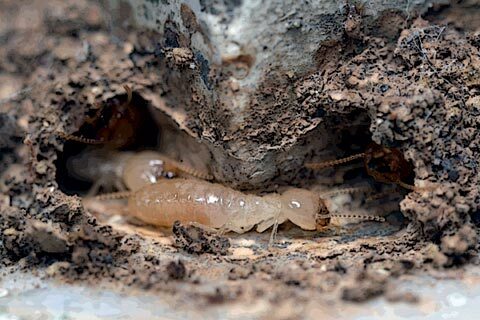 Termite workers inside a tunnel. Photo by David Mora. 26. Can they cross concrete? Termites cannot cross concrete; they make use of the cracks and chinks in the concrete caused by natural contraction and dilation of the concrete due to temperature changes. 27. If they live in the ground. How can they climb to the beams of the ceilings? To access their meal, termites use the present cracks and hollows in walls to build their trails. Air chambers, electric pipes, and any kind of hollow present in the structure, are used in their incursions searching for food. 28. If affected wood is eliminated, are termites eliminated too? Termites live in big underground colonies and they only climb to the ground surface seeking food. If we eliminate the affected wood, we don’t eliminate the problem, since we are only destroying the termites which are feeding from the wood at the moment: a minimal part of the colony. 29. If there are old trails, is it possible that they have gone? When we find signs of old activity, this is indicative of the presence of termites. 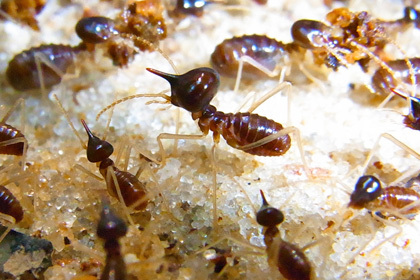 Termites change the places where they feed, because of external condition changes. It does not mean the termites have disappeared. 30. How are they introduced in cities? It is possible they were there before the founding of the city, and persist through residual populations. Another way is through old wood or affected wood being deposited into the city. 31. Do termites have any good function? In a natural environment, termites have an indispensable function: to recycle wood back into the natural ecological system. 32. Are they like woodworm? Both woodworm and termites are insects; the woodworms belong to the coleopteran order popularly known as beetles, while termites belong to the isopteran order. Their external aspect is different. In wood, we can find the larva of the woodworm; it has whitish colour, cylindrical body, no legs, and hard sclerotized jaws. Adults have brown colour, with six legs, with their first pair of wings completely sclerotized, forming a hard shield over the length of the body, under it there is the second pair of wings. As for termites, the majority of the castes have white colour, and six legs. The winged termites are almost black, have six legs, and their four wings which are of the same size, with translucent black colour and this length doubles the body of the insect. The presence of cylindrical holes about 3 mm in diameter (or over 5-7 mm in case of the big ones) is one of the symptoms which determine the presence of small woodworm. 33. Must we use oil or any insecticide of domestic use? Oil and insecticide are only of use against drywood termites. For subterranean termites, you only scare them temporarily, and compel them to attack wood elsewhere in your home. 34. How can I contact an expert in termites to ask his advise? 35. Are home remedies to eliminate them effective? The home remedies often suggested, are totally ineffective, and help disperse the infestation even more, as the termites change their place of feeding to other spots in your home.